Portable Shower - Bedside Shower 11.3ltr Capacity. 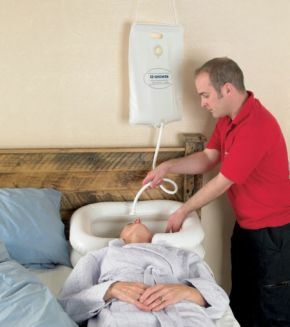 A practical bedside shower that can be hung on either a bed post or IV pole via a strong nylon cord. The bag holds 11.3 litres (2 1/2 gallons) of water, which is directed through a 80cm (31 ") hose to a compact shower rose. The hose has an on/off switch so that the user has full control of the water flow. Ideal for use with the inflatable bath or shampoo basin.